FYI: The ISU Recycle Center (North 9th St. on campus) and Art Totality will have a FREE Reuse Book Swap at the ISU Recycle on Saturday, June 29 from 10 a.m. to 12:30 p.m. Bring your books to swap or donate. To register for this FREE event go to http://communitybookswap.eventbrite.com or just stop by. Alberta Comer, dean of Indiana State University’s Cunningham Memorial Library, will be leaving her position to serve as dean and director of the Willard Marriott Library and university librarian at the University of Utah. 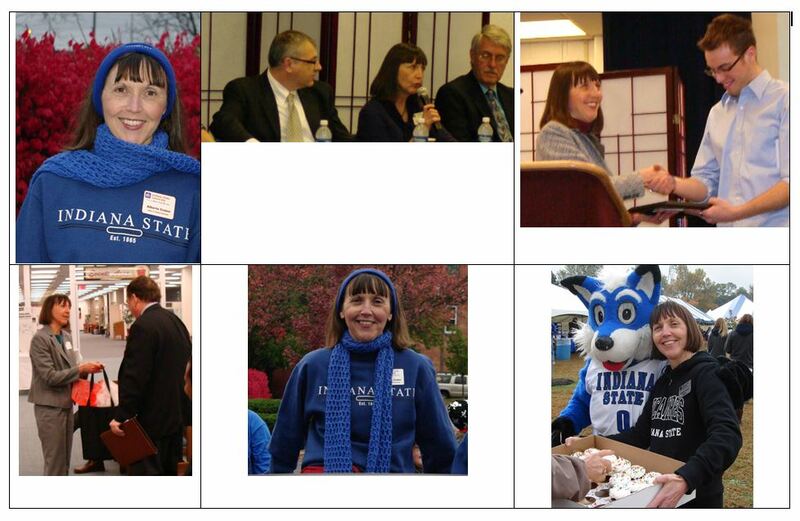 Under Comer’s leadership, Indiana State developed a number of innovations, including an academic library consortium across Indiana State, Rose-Hulman Institute of Technology and Saint Mary-of-the-Woods College in partnership with the Vigo County Public Library to establish an integrated online library catalog system. In announcing Comer’s appointment, Michael Hardman, interim senior vice president of academic affairs at the University of Utah said she has a national reputation as an inspiring and thoughtful leader. “She brings to the U an expansive knowledge of libraries, as well as a strong focus on students, faculty collaboration, and the cultivation of positive community and donor relations. We welcome her to Utah and the university,” he said. The Marriott Library is the flagship academic library for the Utah State System of Higher Education and the largest state-funded academic library in the six-state region of Idaho, Montana, Nevada, New Mexico, Utah and Wyoming. Its holdings include 3 million volumes and nearly 200 unique digital collections containing photographs, maps, books, audio recordings, newspaper articles and other items. The library also holds more than 1 million historical photographs and extensive film collections. Comer holds a master of library science degree from Indiana University-Bloomington. She has served as editor of Indiana Libraries, published by the Indiana Library Federation, as well as editor of Cognotes, the daily paper of the American Library Association Conference. She is a member of the American Library Association, the American Indian Library Association, the Association of College and Research Libraries and the Indiana Library Federation. She will begin her position at Utah on Aug. 19. She replaces Joyce Ogburn, who served as dean until 2012 and recently accepted a position with the Appalachian State University libraries. Biff Williams, dean of the College of Nursing, Health, and Human Services, and incoming provost at Indiana State, said a national search is planned for Comer’s successor as dean of Cunningham Library dean. The following training sessions are scheduled in the library’s Instruction Classroom, 230, per Sarah Edwardson, Office of Information Technology and Barb Austin, Reference/Instruction Department. Training Objective: Provide overview of MySAM, review SEP, Notes, Exception Management (perform Fall 2012 exceptions during training). Training Objective: Provide overview of MySAM, review SEP, Notes, and expectations as chair and department’s use of MySAM. 1.5 hour sessions (Chairs can choose one of the following sessions). Training Objective: Provide overview of MySAM [aka My Student Academic Map], review SEP and how to create/edit 4-year plans, Notes, Audits, etc. 2 hour sessions (Advisors can choose one of the following sessions or attend as many as desired). Note for students: Students readmitting to Summer or Fall 2013 will take advantage of ISU’s new degree-audit system called “MySAM,” now available on the MyISU portal (go to the Student tab and select the link for Degree Audits). If you are are a readmit student accessing MySAM before your readmit term has begun, you may need to run a What-If audit for your readmit major and readmit catalog term to ensure you’re viewing up-to-date degree requirements. Check with your academic advisor if you have any questions. Heather Rayl, Emerging Technology Librarian has been awarded a $10,000 LSTA Grant to design and implement an information literacy game using iPad Minis. She will be running the game in the spring semester. Reference/Instruction librarian, Shelley Arvin, will work with Heather on designing and implementing the game. Thanks should be awarded to Reference/Instruction Librarian, Edi Campbell, for originating the idea and doing some of the initial work on writing the application. Congratulations to all involved! Heather Rayl, Emerging Technology Librarian, will be participating in a presentation titled “Massive Open Online Courses: The Future of Education” at ALA Annual in Chicago on Monday, July 1. The idea for the presentation came after participating in a MOOC on MOOCs, fondly known as the moocmooc. Heather put a call out for librarians interested in crafting a program discussing MOOCs and librarianship. Three other librarians from all over the country joined in, crafted the proposal, and created a presentation. The slides will be available for viewing after the conference. Congratulations, Heather! Annual Library Book Sale Set for JANUARY 2014 – CANCELED! Earlier than ever! The 2014 book sale is set for Tuesday – Thursday, January 21 – 23, in the Library Events Area. Sale times will be daily, 9 am – 6 pm. SORRY EVERYONE. DUE TO A VARIETY OF CIRCUMSTANCES, THERE WILL BE NO BOOKSALE THIS YEAR. Reference/Instruction Librarian, Cheryl Blevens, was asked by Barry Baker, editor of the “Technical Services Report” column that appears in Technical Services Quarterly, to write an article that summarized the discussion held during an ALA 2013 MidWinter session, for publication in the journal. Cheryl’s article, “Technical Services Report: Report of the LITA Distance Learning Interest Group Meeting. American Library Association Midwinter Meeting, Seattle, January 2013,” is now available at Taylor & Francis Online, and can be accessed at: http://www.tandfonline.com/doi/full/10.1080/07317131.2013.787866. Reference/Instruction Librarian, Edith Campbell, will work as a consultant with the National Geographic Common Core Alignment Program to review and align National Geographic publications to the Common Core Curriculum. Where possible, classroom activities will also be developed. ISU students, faculty and staff can now download the newest version of EndNote via our download page. EndNote is a bibliographic management software app that the ISU Library has subsidized for the campus for many years. If you still use the older, less sophisticated Citation software system, you should switch to the much more powerful EndNote. EndNote® gives you the tools you need for searching, organizing and sharing your research. It allows you to easily create bibliographies while writing your next paper with features like Cite While You Write®. Maximize your time with features like finding full text for your references and automatically updating records. Whether you’re on your desktop, online, or iPad, EndNote’s syncing capabilities let you access all of your references, attachments, and groups from anywhere. Search hundreds of online resources for references and PDFs. Find full text in one click. Import records from PubMed with the new direct export format. Hand-off Word files with full reference files. Never have to type a bibliography from scratch! Format references for any project with Cite While You Write®. Create uniform citations and footnotes with new formatting tools. Sync your research across your desktop, online, and your iPad. While search in ISU Library databases, you can export citations directly into EndNote files and then from those files attach a link back to each PDF article you have downloaded. EndNote is a Thomson Reuters product.